We take our responsibility to maintain your privacy very seriously as the confidentiality of your dealings with us is required by law. The following document sets out how we collect and use the information we hold for you but, if you have any questions on any aspect, you should contact us via one of the methods shown below. When you join the practice, we ask you to complete a data sheet containing your name, date of birth and contact details. When completing this data sheet, you can opt out of periodic email newsletters if you do not wish to receive them. If you do not tick the opt out box and sign the form, we assume that you are happy to receive these. During treatment, we may record any information concerning your treatment and conversations between the clinicians and you. These notes will be included in your dental records. Via the contact form or appointment request form on our website. When you visit our website, a small text file called a 'cookie' will be stored by your browser on your computer's hard drive. We use them to identify when you have returned to our website, to understand the services that may be of interest to you, to provide anonymised tracking data to third party applications like Google Analytics and to advertise the practice via the Google Display Network (GDN). The GDN periodically displays adverts for websites you have previously visited. These adverts are diplayed on unconnected websites which participate in the GDN. Your visit to our website is recorded solely by the cookie and no other personal data is passed on. If you wish, you can disable cookies on this website and others. You do this by amending your browser settings - if you do not know how to do this, you should consult your browser's help facility or refer to www.aboutcookies.org which gives further information on how to do this. The personal information we hold on you is, with one exception, used solely for the purpose of maintaining a record of the treatment you receive & other interactions with the practice and to enable communication between ourselves. The exception to this is when you have given permission for your email address to be used to send you periodic newsletters. You may opt out of receiving these at any time. The personal information we hold for you is confidential and is not normally shared with anyone outside the practice without your permission (which will normally be in writing). When you join our membership scheme, the original of the form you complete and sign is posted to Claremont Ltd who collect the monthly direct debits on our behalf. When you opt in to our email newsletter, your email address only will be entered into a database held at graphicmail.co.uk which we use to produce and send the newsletters. This is via the form on our website and no data other than your email address is sent. Your information will never be sold or otherwise shared with third party organisations for use in marketing or other contact campaigns. You have the right to see all information we hold in your records including dental records, notes, xrays and clinical photographs. If you would like to do this, you need to submit your request in writing to the address at the top of this page. We make a charge of £10 towards our costs in collating the data. If you have subscribed to our email newsletters, you may unsubscribe at any time. Every newsletter includes an unsubscribe link but you can also request this by writing to Nigel Cryer at the address given above. It is our policy to retain your dental records for an indefinite period to ensure that, at any time in the future, full details of the treatment you have received are available. This is for your protection in the event of any queries or concerns in the future. The Deartment of Health advises that dental records should be kept for a minimum of 11 years and requests for deletion of records will only be considered after this time has elapsed from the date of the last treatment at the practice and will be at the discretion of the practice. We may seek legal advice as part of the decision process. Email is not a secure medium and we therefore try to avoid its use for sensitive information wherever possible. When sending dental records by email, it is our policy to use either the patient's initials or their first name only to avoid the risk of identification should the email fall into the wrong hands. You should be aware that communication with the practice via the online forms on our website uses unsecure and unencrypted email and you should not use these forms if you do not want your personal information sending in this way. relevant links to other websites are provided on many of our web pages. We do this to provide you with further information about the content on the page. Enter your e-mail address below to subscribe to our newsletter and receive regular updates about AllClear & the services we offer, special offers and advice on how to keep your teeth, gums and mouth in great health. 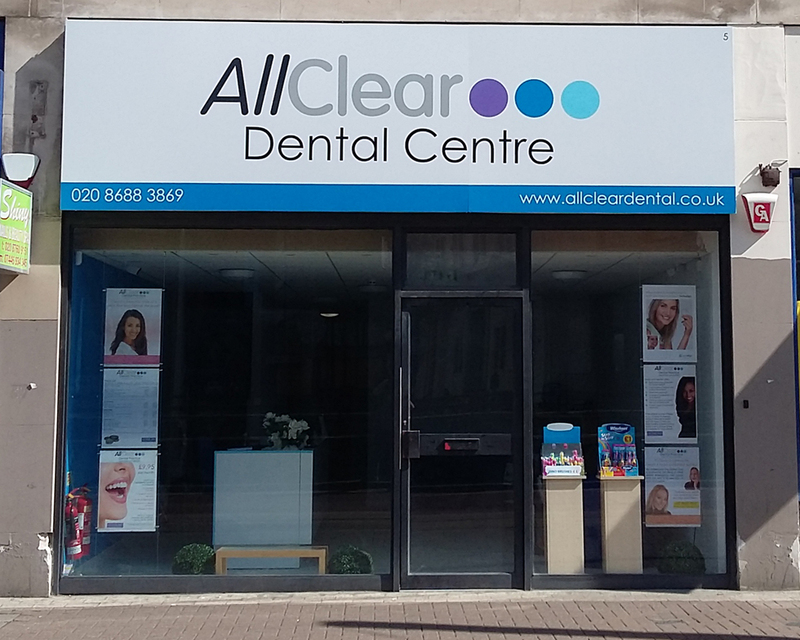 © All Clear Dental Ltd 2014. Website designed and page written by Nigel Cryer. Page last modified: 12.07.2015.